The San Antonio Commanders' schedule hasn't been easy, with four-straight games on the road. After losing the first of those, San Antonio has won its last three, and now they get to head home for three straight in San Antonio while sitting atop the West division at 4-2. A big reason for the Commanders' 3-1 road stretch has been their offense. They scored 26 first-half points for the second-straight game on Sunday, and this time they didn't let up, as they did after barely hanging on to beat the Arizona Hotshots the week before. San Antonio blanked the Atlanta Legends in the final two quarters Sunday to win, 37-6. Two touchdowns came on returns: a 79-yard punt return by Greg Ward Jr. and an 87-yard interception return by safety Derron Smith, who scored on a 66-yard interception the week before. San Antonio leads the league with 12 interceptions and had three Sunday: Smith's third of the season, De'Vante Bausby's fourth (the most in the AAF) and Zack Sanchez's third. Here's what else we learned in Week 6. After losing Zach Mettenberger to an ankle injury on their first offensive play in Saturday's 22-9 loss to Salt Lake, the Express went all-in on quarterback Johnny Manziel, who was released recently by the CFL's Montreal Alouettes. 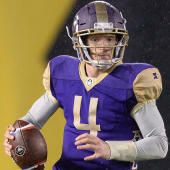 The 1-5 Express claimed Manziel via the waiver system after the Commanders relinquished their college allocation rights. Memphis is at home for three of their final four games and their one road game is in the regular-season finale at San Antonio on April 6, a game to be televised on CBS Sports Net. The Orlando Apollos – and quarterback Garrett Gilbert – aren't invincible after all. For the first time this season, the Apollos scored fewer than 20 points and dropped to 5-1 after a 22-17 loss at home to the Hotshots. Gilbert, a top candidate for league MVP, entered the game having completed 62.8 percent of his passes without an interception. He was less than 50 percent Saturday (23-for-48, 47.9), throwing an interception and losing a fumble on a sack. Then, when Gilbert completed two passes totaling 74 yards to reach the Arizona 8-yard line in the closing seconds, virtually the entire offensive line betrayed him, moving before he could stop the clock with a spike. The resulting 10-second runoff after a false start ended the game. Birmingham began a final stretch of four out of five road games by winning a critical game in San Diego, 32-29, on a 44-yard field goal by Nick Novak with no time remaining. Quarterback Luis Perez, who been replaced by Keith Price last week, replaced Price on Sunday and passed for 359 yards and three touchdowns. He led the Iron down the field on a 50-yard drive for the winning points. Trent Richardson continued his powerful running, often carrying tacklers for additional yards and touchdowns or first downs. He had his ninth rushing touchdown of the season and added a reception for a score. All Richardson's rushing TDs have been in the red zone and they have totaled 29 yards. Richardson's long run of the season is 10 yards and he's averaged 2.5 per attempt (91-for-227) and was 16-for-46 against the Fleet. The Hotshots snapped a three-game losing streak to get back to .500 in large part because of two successful 2-point conversions and field goals of 53 and 55 yards by Nick Folk. Arizona is best in the league on conversions (10-for-14, 71.4 percent) and made its only two against Orlando. The Apollos failed on one of their two and are 8-for-19 overall, hitting just 6 of 15 on pass attempts. Meanwhile, Alliance kickers are 78 of 94 overall on field goals and 6-for-12 from 50 yards or more (Folk is 3-for-4 from 50-plus). The Hotshots were also buoyed by the return of linebacker and defensive leader Steven Johnson from a hamstring injury and wide receiver Richard Mullaney from a knee injury. Both played in the first two wins, then were out for the three losses with Johnson leaving during the Week 3 loss to Salt Lake. Saturday, Johnson totaled 12 tackles (eight unassisted) with one for loss and an interception. Mullaney contributed six receptions on seven targets for 73 yards to complement Rashad Ross, who was 5-for-51 on 10 targets and played with a shoulder injury. For the third-consecutive week, San Diego's fate came down to a late-game field goal. In Week 4, they lost to Memphis on a 46-yard field goal with 2:42 remaining, then defeated Salt Lake last week on a 44-yarder as time expired. That was the situation again Sunday in a 32-29 loss to Birmingham on another 44-yarder. Third-down (2-for-12) and 2-point conversion (1-for-4) failures doomed the Fleet. For the season, San Diego is 4-for-16 on conversions, including 1-for-7 on pass attempts. Salt Lake defensive end Karter Schult added to his league-leading sack total with two against Memphis to give him seven this season. That helped the Stallions improve to 2-4, along with tight end Nick Truesdell, who has become a security blanket for quarterback Josh Woodrum. Truesdell has been targeted 18 times this season and has caught them all for 181 yards and three touchdowns. He has 11 receptions for 138 yards and two scores in the last two games. All the good vibes of Atlanta's two-straight wins and 400-plus-yard offensive outbursts in those games evaporated amid a blizzard of turnovers: three interceptions and one fumble. The Legends outgained San Antonio, 290-234, and ran 67 plays to the Commanders' 48. Quarterback Aaron Murray completed 30 of 41 passes, but for only 215 yards (7.2 yards per completion). The Legends, now 2-4, were in San Antonio territory only three times and on one of those their possession started at the Commanders' 47-yard line. All of the games in Week 7 are between conference rivals. A crucial West encounter has San Diego visiting Arizona Saturday afternoon on CBS Sports Network. Both teams are 3-3 and are one game behind first-place San Antonio, which is at home on Saturday night against Salt Lake. Orlando's loss and Birmingham's win moved the Iron back to within a game of the Apollos in the East. Orlando travels to Atlanta Saturday afternoon, while Birmingham visits Memphis Sunday night in what could be the Alliance debut of Manziel.